Ayesha Salie, Sesam Mngqengqiswa, adn Bhanekazi Tandwa on a learning boot camp in Worcester, Western Cape Province, South Africa. May 2017 will see South Africa will launch the first private satellite into space from Africa. The fact that a group of school girls are responsible is even more historic. Cape Peninsula University of Technology are responsible for this historic feat. 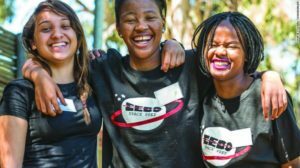 They are trying to encourage more women to enter the field of STEM and so satellite engineers from the university have trained the group of 14 students. The payloads that the girls have designed and built that will scan Africa’s surface. It will gather information on agriculture and also on food security. The aim is to establish as well as predict the weather problems that Africa will face in the future. This year saw a major shortage in the amount of maize produced in southern Africa. This in turn led to a drop in economy. If this project is successful it could help improve the continent’s economy in the coming years. The organisers of the program also hope to expand in the next few years. Girls from Rwanda, Kenya, Namibia and Malawi would get the chance to experience the world of STEM. Some of the girls involved in the current program hope to achieve more by going into space themselves.